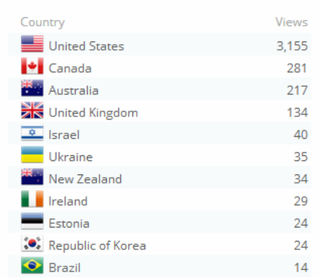 Whoa, the international stats on my blog are mindblowing. 284 Canadians! WOW! It turns you, you lucky people are being entertained by probably the most famous blogger to all of Canada. They probably worship me as a god there. I would go, but I would hate to let them down. What if I do not live up to their god-like expectations of me. What if they expect me to cure their diseases or raise their dead? I don't think I have those blog powers yet. The United Kingdom! Wow 134 people there! You know, I have not been to the United Kingdom. I have been to the Magic Kingdom. It was a good place. Do you think they give you free balloons during the parade at the United Kingdom like they do in the Magic Kingdom? Because if so, I might have to go and check that out. Seems pretty good, especially if there is a balloon involved. The only thing though that this stuff doesn't show though is the people who are not from this planet who I personally know do track and read my blog as part of a complex alien digital monitoring system. But I guess WordPress analytics does have an algorithm to calculate inter-stellar clicks. That's cool. Way to short me on my page views, WP. Anyway, thank you all very much!!! Wherever you or the ISP router that carefully disguises your identity is! You are all awesome and I love you!